Oops, it's a while since I've posted on here. 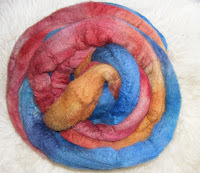 My other blog's quite active, but at this time of year dyeing rather fades into the background. I've just sold a couple of skeins of laceweight yarn to the US - this may actually give me the impetus to sort out the end of year remainder of my fibre stall stash and update my Etsy shop. Not that many people will be buying so close to Christmas. I'm officially sick of knitting huge plain socks, as I'm about two-thirds of the way through the first of Mark's pair, having finished Pa's last week, and will have to grit my teeth and get on with the other one. Lots done today though, over at Carol's for a festive gathering of fibre-friends. We did a fibre swap and I came away with a rather nice hunk of naturally-coloured alpaca top overdyed with greens and teals, a bag of ginger biscuits, and half a chocolate cake for Mark. And a quick journey back on two trains - a thoroughly win day! Lots of knitting being done, mostly travelling to and from work, and it's all socks. These ones above are for Pa for Christmas, Zitron Trekking Pro Natura used double on 2.75mm needles, my generic toe-up sock loosely based on PGR's short row heel and toe. I have more yarn than I though, so once I've finished the second and made it longer I'll unpick the first sock's cast-off and lengthen to match. 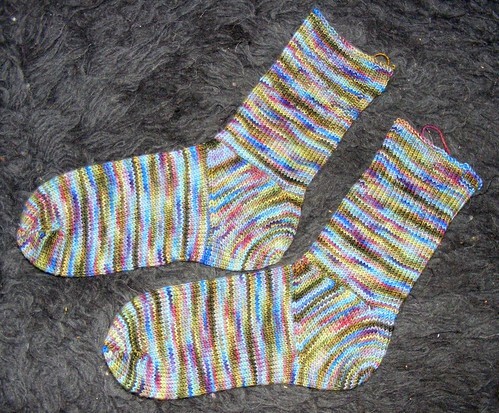 These are for Ma, in Colinette's utterly wonderful Jitterbug yarn, in the Dusk colourway I think. 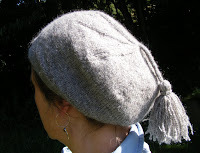 It's the Hat-heel pattern that was in the most recent issue of Knitty. 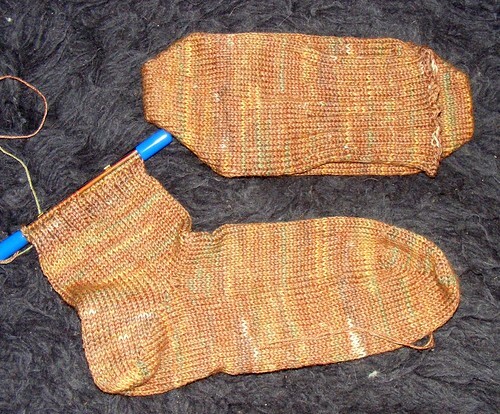 It's certainly an interesting way of constructing a sock, but it doesn't give as deep an instep as I hoped. But it'll be easy to replace a heel - just pick out, pick up and reknit! I have one new project knitted, dyed and finished. I have a sleeve of the Tangled Yoke cardigan (IK Fall 07) nearly finished in beautiful Bowmont Braf 4ply that I dyed in deep sea green. Last night I decided to pull some bright blue aran bfl from the stash (traded earlier this year) and cast on an Elsewhere, after seeing at least two of them on bodies at Eden Valley's meeting last Saturday. But the computer at home is dead. And really I'm finding it so hard to get organised enough to photograph new things in daylight, and then remember to bring the camera card into work to download the photos here. My computer man was supposed to be coming on Tuesday evening, but that got cancelled at the last minute - and even though I'd told him a couple of times at least that it wasn't starting up at all he still wondered if it could be sorted remotely. 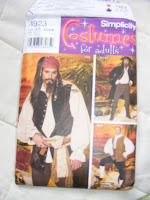 Anyway, once I've finished the Soddin' Pirate Coat (see other blog) he and his son Tom will have to come and collect it, and I won't let it leave the premises until I'm up and running again. Off to Mungrisdale in the Lake District tomorrow morning, tucked away under Blencathra, to teach a workshop at the Eden Valley Guild. Here's most (but not) all of the stuff I'm taking. Three large checked bags, full of my dyed fibre to sell as I've had several requests to make sure I bring it. The silver padded bag in the foreground is my Little Gem wheel, much easier to pack than my Suzi Pro. It had it's own kate and extra bobbins and a nostepinde tucked inside too. The green box contains several pairs of hand-cards, a couple of pairs of hand-combs, a spare kate or two, spare bobbins, some big cones of thread and various bits of spinning impedimentia. Oh, and spindles. The shoe box is full of various and exotic yarn samples. And lastly the brown paper sack has clean shetland fleece, shetland roving and a few different balls of wool tops. Plus some books tucked away. Because we've got clothes etc for tomorrow night, plus dogs, plus the bike I hope I'm collecting, there's no way I can take a plastic crate or two of things wot I have made to use as class examples. People will just have to remember the marvellous things I've made (!) and admire the yarn samples.... At least there isn't a tent in there too. So we're off at 7am at the latest, hoping to get there for ten. Teach all day - Mark will go out with the pupz somewhere. Then off we go to the other side of the country, and spend tomorrow night with Denise and Tim and Deefa and Holly, who will hopefully not laugh at Bil's poor scarred face. And Ma is leaving for Nepal in the morning too. We popped up this evening to drop off her camera, lipsalve, suncream and various other bits and pieces that for some reason I'm supplying. I still don't think Pa really knows what's going to hit him, especially as we're not around this weekend either. The cat knows we're going too. I'm being infested as I'm trying to type this. And she'll probably try to smother me in my sleep too, not to mention jumping up and down on the keyboard. No rowing; withdrawal symptons already. or at least not by natural light. 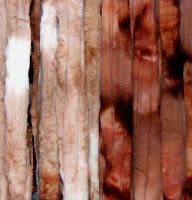 The colour on the right was my attempt, last night, to dye some superfine merino in Caramel. Unfortunately I have changed the source of some of my dyes since I wrote the recipe and it came out far too orange. The one on the left is more like it - more brown, not orange, and the white areas were specifically requested. It was an order for 500g, so there's another 200g bubbling away (one left over for sale) and then I've put a blend of greens and the same brown in the other pot. Merino and alpaca laceweight in Triton. Perhaps a little greener than is showing on my monitor for this photo. I seem to be leaning more towards this blue green at the moment rather than my more usual acid/yellow greens - odd given the time of year. 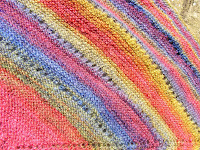 And this is Steelsheen in the same yarn, dyed for a swap on Ravelry -I have fallen in love with Symphonie multicoloured wooden dpns (due to the lovely Sarah giving me a set for my birthday) so when I found someone offering sizes I didn't have for sale or trade, I was prepared to be generous..... There's two lots of fibre going off with this yarn too. I'm sitting here in front of the computer, finding it hard to type as I'm wearing plastic gloves - there are dyepots bubbling in the kitchen, and if I take off the gloves everytime I don't actually need them, I have to use a fresh pair. Typing with slightly too big gloves is not easy. But I'm alternating between watching rowing videos on Youtube and running downstairs when the soddin' pupz decide to tell me there's someone at the door. Last time it was the neighbours shouting at their dog running off; my two are starting to call 'wolf' just a few too many times now. There is a lot of rowing on Youtube. I've just dyed some merino/alpaca laceweight yarn, 3 skeins each in Steelsheen (no-one has yet managed to get the LotR reference here) and Triton. Just in is 400g of superfine merino in a new version of Caramel which I'm hoping is not coming up too red, I need 500g of this for an order I've had in. Then I'm might try and motivate myself to get a bit of superwash done in dark greens for Lancs & Lakes Guild in a fortnight's time, and perhaps something really nice for Ambermoggie in exchange for the bike. Can't wait for the bike. Latest knitting on the train this week. I think I started these on Wednesday and finished all but the thumbs last night. Those were done quickly this afternoon. Now I have no excuse not to finish the green thing or Mark's (even more overdue) brown gansey. However, I had such a lovely time with fine yarn and little needles that I may feel the need to do more. 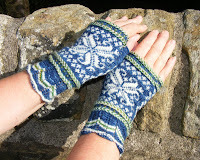 I just love the uncharacteristic (for me) detail on these - both fine colourwork and twined braiding. The blue and the white yarn is Baa Ram Ewe's undyed BFL sock yarn - I dyed the blue with indigo myself. The green is a very similar yarn that the lovely Sarah dyed for me in various greens last year. 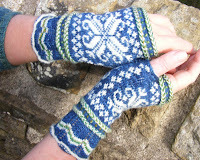 This will feature in it's own thing later; I actually started off with a plainer pair of mitts in this alone, but got sidetracked by colourwork. I can't write a pattern up for this. 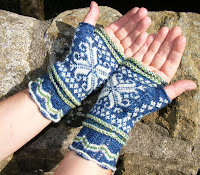 The cuff is taken directly from Nancy Bush's 'Folk Knitting in Estonia' (Hilja's Mittens) and the basic star from a DROPS sock design. 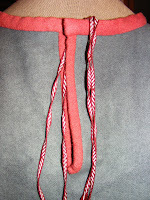 The braid is the standard twined/twisted two-colour one that I will put on anything, given half a chance. I just can't wait for the weather to get cold enough to wear these. This is growing nicely, the basic tunic loosely based on Piecework's 17thC Undershirt. I started the neck last night (and would probably have made a better job of it if I hadn't been watching 'Flashforward'!) and finished it waiting for a train home. It'll look much better when blocked - and it still smells ever so slightly, and not unpleasantly, of the smoke in the roundhouse on Bodmin. 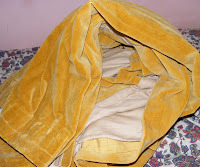 is about to become this, a Pirate Coat! I can see this keeping me quiet for some time. Poor Mark's on nights this week, and leaving even earlier this evening as he's quizzing in Bradford, so I may just tuck myself away upstairs with the shears and pins and tapemeasure and get started. Long day today. Up early to stuff the slow cooker with a rolled mutton shoulder, sausages and lots of veggies before Otley farmers' market. 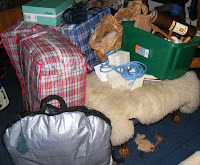 That done (and the bare minimum - freezer and fridge stuff - put away) we all piled in the hired van and off to Masham. A young handler's pride and joy, obviously fluffed and titivated to the limit. I think it's a Swaledale, uncharacteristically clean and white. The two big breweries in the town make the most of the occasion. 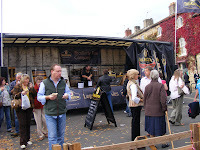 This is the Theakston cooper demonstration van. Worth watching the demonstration if only to see people plucked out of the audience to have a go failing miserably because they lack a third (and fourth) hand. 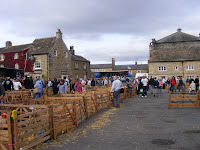 Behind the church they have sheep races and demonstrations of sheepdog working, except the latter uses ducks. Here are the stunt ducks relaxing between demonstrations - the jacuzzi was popular (click for bigger, as with all). And the ladies of this breed, while not quite so impressive, still can pack quite a headful. 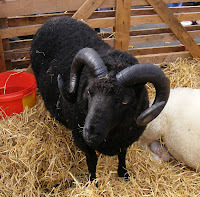 Hebridean ram with a baleful stare. 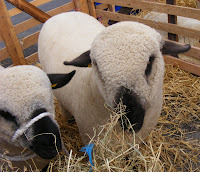 Teddy bear sheep - Hampshires. Mark approaching after stashing my two new fleeces in the car. 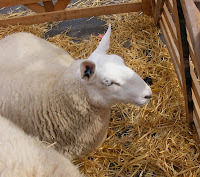 I knew I wasn't supposed to get more fleeces, but I had to have a look in the fleece tent, just to see. I found a lovely little Ryeland, probably a shearling, nice and soft and small. 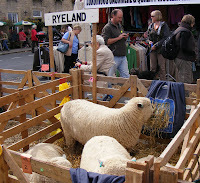 Lots of Ryeland fleeces there. 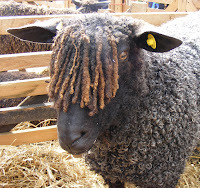 I was really looking for a true down-type - there was a Southdown fleece but it was horrible: very short, filthy, full of second cuts. Ick. I also succumbed to a Jacob - I shall chuck at least half, because it needs a vicious skirting, but it's long stapled, surprisingly soft, and the white's a good clear white with a very dark brown. Could be nice. Currently stuck in the kitchen until I can get them washed; I hope the weather continues fine enough to dry outside. We had lunch with Denise and Tim from Whitby, and I was appalled to remember on returning home and checking Facebook that it was Denise's birthday today and I'd completely forgotten. I'd even remembered earlier in the week. However, Bil left lots of licky messages on Denise's knees for her two pupz, Deefa and Holly, to pick up later! 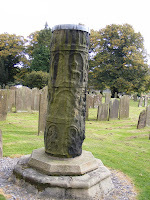 The ancient carved cross in the churchyard. 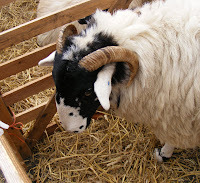 I do like the look of Cheviot sheep - a good, basic, down-to-earth Northern sheep. Nothing fancy, excellent wool if not terribly soft. Great for socks! Mostly used for carpets these days, what isn't burnt by the farmers of course. And a Scottish Blackface. Archetypal sheep of the hills. A splendid black Wensleydale and his chum. They look so dark when unshorn, but once the fibre's processed it gets paler and warmer until a black Wensleydale top is more of a dark creamy brown. And always much 'fluffier' than the same breed's fibre in white. A close-up of the previous fellow. A couple of books also sneaked under the radar at P&M Woolcraft, plus a copy of Wild Fibers, but I have practically all the tools I really need now so managed to restrain myself from complete giddiness (especially after the extortionately expensive set of Symphonie interchangeable circulars I got at Baa Ram Ewe on Friday). And the casserole this evening was really yummy. Latest thing off the needles, finally cast off last night. 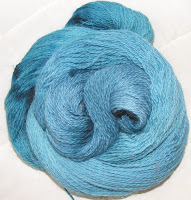 I spun this up from 100g of oatmeal BFL dyed in Northern Lights at Swordfest on Bodmin Moor the other weekend. 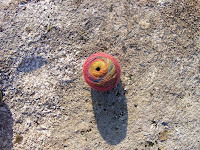 Spindle spun over two days, between making faience beads, cooking curry for 32, and generally prancing around in the Bronze Age. (Large quantities of sloe gin may have been involved. 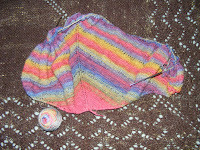 I was originally planning to chain-ply it for socks, but the colours were so pretty I decided to use it as the singles, so wound the two cops into one ball, colours all running in the right direction, and started knitting. This was as far as I'd got when I got home. I started off with five or so stitches on 3mm needles, and increased on alternate rows, two either side of the centre stitch and two on each outer border, making a Danish shawl sort of shape. I threw in a row of eyelets, offset by stocking stitch rows, every 9 rows of garter stitch, and increased a needle size after each eyelet row. I ended up on 4mm needles. Finished last night, washed and blocked in the dark of this morning (about 5.45! ), and photographed on the stone seat by the river in the sun this afternoon. ... I have a fair bit to update, but need to remember to take photos in daylight to get somewhere. Finished my bag hat in plenty of time to take to Cornwall tomorrow morning. Holds my hair snugly out of the way, isn't much warmer than my hair itself, and has the massive advantage that there is no point of pulling/tugging/tightness that I can get from staking it up or braiding it back. And hopefully no smoke from the fire in the roundhouse either. It's not terribly easy to take your own photo like this. And I'm cooking for 32 tomorrow night, only five of whom are veggies. That'll keep me out of trouble. I have been dyeing again. Cheviot top, which I used to use lots of, but not so much recently. Not ideal for real next to the skin softness, but fantastic for socks. Takes colour fabulously. The orangey shades here are dyed in my Redleaf. The blue/teal is one I invented to try to copy the sky in the wonderful September weather towards the end of the day - clear, clear blue just sinking towards teal. 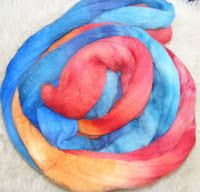 And exactly the same colourways, but this time in the coloured BFL top. Infact, it was the same two dyebaths. I really do prefer how the natural oatmeal wool mutes and enriches the dyes. 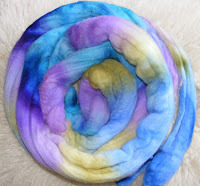 And some special dyeing for my chum Carol, who asked for some dyed with short colour changes to help with the teaching of spinning. 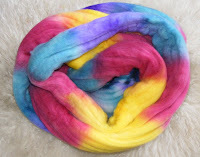 I have dyed up one special colourway for her - the eponymous 'Carol' but we felt like a change for this lot. And they haven't got names yet. I'm not normally into pink, but I love how the two different pinks shade in and out and react with the greens. I was thinking Scandinavian reds and blues here - which lean more towards Prussian and orange. I think this will look lots better spun up than in the fibre. The yellow's a bit bright, but will stretch out beautifully into the maroon. I do seem to keep going back to blues, greens and purples. But I'm not the only one. 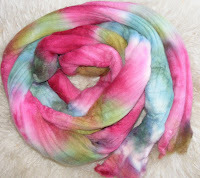 I finished dyeing about 11 last night, having not started until Mark left for work about 8.30. At least using the ordinary merino rather than the superwash I don't have to start with a cold dyebath each time - reusing the same hot water for each lot (and there's three lots of two dyebaths here) saves time and energy. 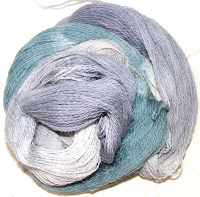 The last lot through was the Cheviot and BFL - there was 100g of each in each pot, and the blue had so much turquoise in it that it hadn't exhausted when I went to bed. I turned it all off and when I spun it out at about 5.25 this morning not only was the water crystal-clear, there was still some residual warmth too. Even wet wool holds heat. The tunic isn't quite finished yet - this is a length (42") of tablet weaving that I've done for the neck opening. Very simple pattern with just 6 cards, but rather effective. I'll finish the dratted thing tomorrow; then all I have to remember to do is take it down to Cornwall with me. It's worth clicking to make bigger. Oops. 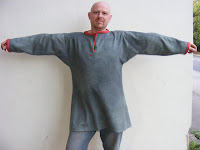 I have been meaning to make this tunic for Jeroen the bronze-casting rocket scientist since last year's Swordfest. Which explains, of course, why I've finally started it with less than a week to go. This is in exchange for the fabulous finishing and scabbard he did for my rapier last year. 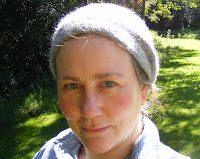 He gave me the woollen fabric last year - a large chunk of a herringbone twill which I've dyed green (a grey green, but greener than these photos show) and a small piece of a diamond-twill pattern, which I've dyed orangey-red to look like madder. I started cutting out and sewing this morning, having worked out shapes and sizes yesterday. There are no shoulder seams. Simple oval and slit for the neck. 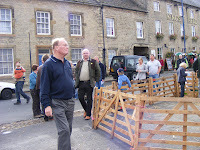 Mark has been out all day - shopping and then out at his local in Bradford - so I'd been able to get on and sew all day. As he was in a good mood when he got back, I made him try it on and stand up against a local white wall to model it. 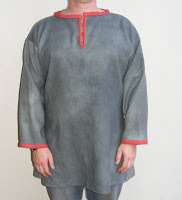 I'm really pleased with the shape and outline of this tunic. 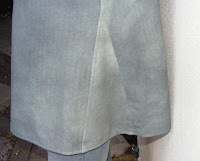 Detail of the gore let into both side seams to give fullness at the hips and lower. 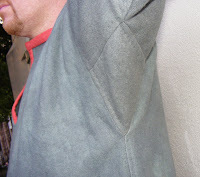 And the underarm gusset. I can't be the only person with a man who finds the mention of 'gussets' hysterically funny. It doesn't seem to matter what context, gusses are intrinsically amusing. And another overall shot, with arms down. The neck looks uneven - I need to put a tuck in the bottom of the slit and a couple of ties, which I shall inkle weave tomorrow morning. It may be a trifle large for Jeroen, but better too big than too small. And he is intending to wear it for his early medieaval persona, plus do iron-smithing in it, so better is probably bigger. I've made sure the wrists are wide enough to allow for rolling up. This is entirely hand-sewn, and my left middle finger is feeling it - this is the one I have underneath the work that bounces the needle back up, and although I've tried all sorts of thimbles I then can't feel the needle so it doesn't work. I use a steel needle on my right middle finger to push the needle through. I did actually want to sew this with linen thread, which would have been more authentic than the brown cotton thread I ended up using. But the linen was too strong for this fabric, which would have meant any stress points would tear through the fabric and not through the seam. Fabric tears are much harder to repair. The brown thread is not terribly apparent. Had the fabric been woven from worsted yarn and not woollen, I could perhaps have unravelled long threads from torn edges and used those. 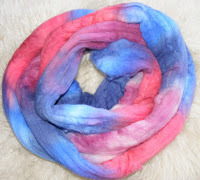 But this is woollen spun yarn, and too weak and fluffy to be used like this. But it wouldn't have fulled so well if it was worsted. Hand-sewing, although labour intensive,doesn't have to take as long as people think it must be. 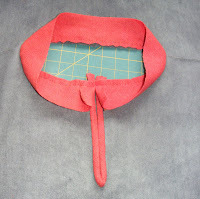 Each seam is sewn with running stitch and then the seams are all flat-felled. The cuffs and neck opening are all bound with straight cut (not bias) strips. Single hem on the bottom. I machine washed all the fabrics before dyeing so they fulled beautifully and don't really fray at all now. I feel the need to knit now. I have lots on the go, but perhaps I shall start something else. Why not be overwhelmed if I feel like it. I have a large glass of red wine, Mark's doing steak and chips and salad for tea, and at least England isn't playing and losing another one day international!